I should be replying to replies, but I am compulsively looking at cards. I am making a list of every card printer, before 1775, whose work is in the British Museum, the BnF, or the Museo Fournier de naipes. I stumbled on something a bit fun. It is hardly anonymous: the name "F. P. Letranger" is stamped on every single card, except one. The one card that doesn't say "F. P. Letranger" says "Andre Bertholet"
After which the master cartiers who are here present: André Bertholet, Charles Bertholet, Etienne Philippes, Antoine Reynaud, Joseph Marchand, François Piccard, and Pierre Cheminade Jr., all masters of the city, have nominated by the plurality of voices with no dissent, and so we place sr Marchand, at the peril of being absent, summoned, and not comparing with the person of Antoine Reynaud master cartier of this city ... etc. M Chaper possède une feuille entière de cartes, fabriquée par Pierre Cheminade. Elle contient 24 cartes ou deux jeux de figures; elles portent toutes, soit à droite, soit à gauche, ces mots FP LETRANGER (franc pour l étranger) ; elles sont sans noms des figures. Le roi de cœur a, sur la poitrine, un aigle à deux têtes; les valets, un liôn. Au dos de cette curieuse planche on lit : "Empreinte tirée du moule de Pierre Cheminade, 2 déc 1710. Pierre Cheminade fils." Mr. Chaper has a whole sheet of cards, made by Pierre Cheminade. 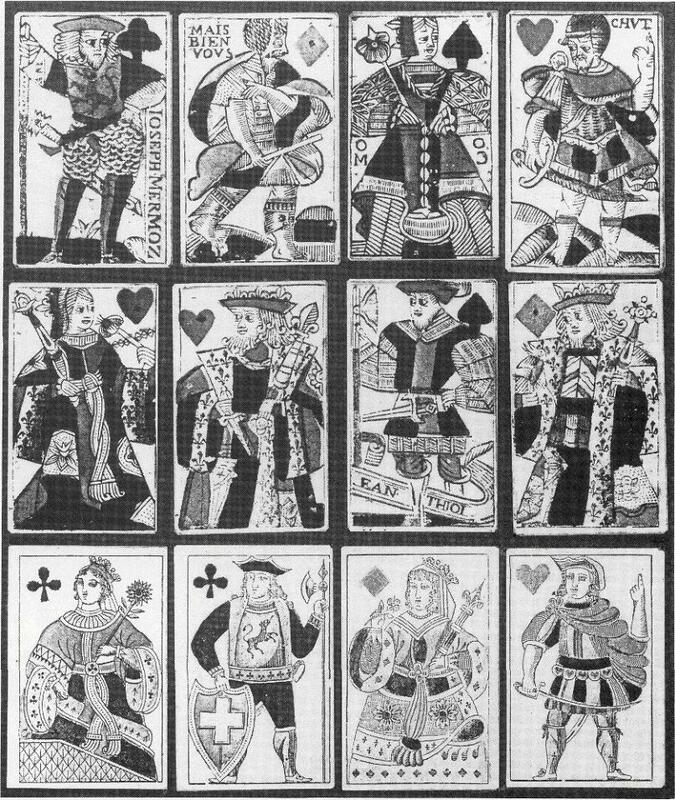 It contains 24 cards or two sets of figures; they all bear, either on the right or on the left, the words FP LETRANGER (franc for foreigners); they do not have names on the figures. The king of hearts has on his breast a two-headed eagle; the valets, a lion. On the back of this curious board we read: "Print from the mold of Pierre Cheminade, Dec 2 1710. Pierre Cheminade's sons." Which is all very well except that "franc for foreigners" doesn't make any sense. Maybe it's fait pour letranger, "made for export" after all. Romans-sur-Isère is a town an hour's drive from Grenoble (due to the road closure on the A49), the subject of a famous history book of the Annales school, and the location of yet another set of early card printers, including C. Bertoin who was making cards in Romans in 1693. I can't read 12.e May 1617 as anything but a date, and several other cards have dates on them, from 1617 to 1623, and each one has a town. One card says "Procedures." I can't think why anyone in 1710 would be writing dates around 1620, and of course if they were writing dates nearer to their own time, the cards must be older than the writing on them. The card maker J. Bourlion was making cards in Grenoble in the 1612-23 period. All the same, there seems too much tying these cards, and their envelope, to 1710, and so I suppose someone had some reason to make note of dates, with local towns, concerning 90 years earlier. Maybe it's fait pour letranger, "made for export" after all. Observe the two cards in the upper left corner, very similar to your two cards. I remember, that it seems to have been a custom, that the Jack of clubs had the name of the card maker in some regions. In German games it developed, that Jacks were often trumps and the Jack of clubs was the highest trump, for instance in "Skat".